Alluring, adorable, astonishing. There is Colour all round in this fascinating mixed bouquet of seasonal flowers; Asiatic Lilies, Chrysanthemums, Gerberas, and Tulips. There has never been a more appropriate description "a lovely bunch of flowers, suitable for any occasion," - hence the name.Lilies may be sent closed/partially closed in order to prevent damage and to last longerVase not included, however if you would like to make your flower gift extra special, we suggest including a Premium Vase to leave a lasting impression.Blake says "A wide and colourful variety of flowers, always a guaranteed partner pleaser." 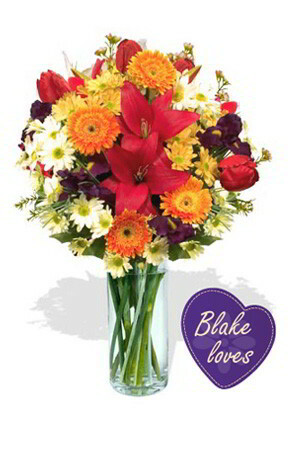 Overall the flowers were easy to order online and the person who received flowers was thrilled with them. However the order was submitted before deadline for same day delivery and when submitted indicated it would be delivered the same day but that was not the case. They were delivered the next morning. They should have correctly informed me of expected time/day for delivery for the flowers. My girlfriend loves it and I am very happy. One thing, though, I think it would be better to have more choices of colour preference e.g. pink and yellow together. Everything as ordered. Excellent product and service. Thank you.